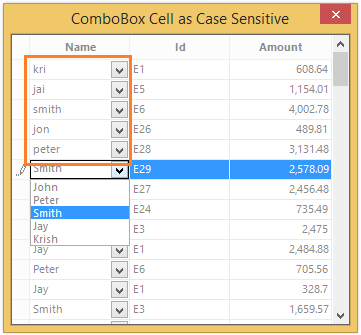 How to make a ComboBox cell as case sensitive? The ComboBox cell can be make as case sensitive by override the FindItem method for custom CellRenderer(CustomComboBoxCellRenderer) to ignore the case insensitive and override the ApplyFormattedText for custom CellModel(CustomComboBoxCellModel) to set the given text to the ComboBox. Step 1: Create CustomComboBoxCellModel by deriving it from GridComboBoxCellModel class. Step 2: Create CustomComboBoxCellRenderer from the GridComboBoxCellRenderer. 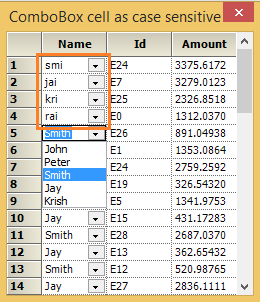 Step 3: Set the CustomComboBoxCellModel into default ComboBox cell.